With tens of thousands of cloud apps on the market, it's infeasible to create policies for each of them, yet that's exactly what security and compliance groups are tasked to accomplish. 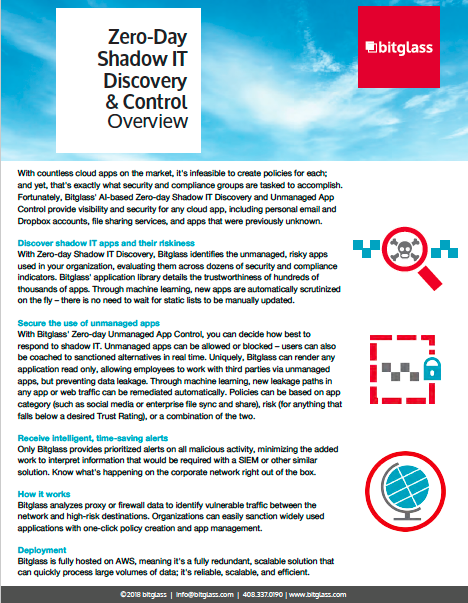 Bitglass' AI-based Zero-day Shadow IT Discovery technology provides both visibility and control for any cloud application, even if that app was previously unknown. Learn why Bitglass is the only complete CASB solution. Download the Overview.